One morning couple of weeks ago I was sitting in my office watching the snow drift down and wondering when spring was going to arrive in New England. Mr Coffee, as usual, had provided a fresh pot of hazelnut coffee and I had a bag of cinnamon donuts from a shop that still makes them by hand. The thing about donuts is they put a solid foundation under your whole morning. Breakfast of champions. The phone rang, disturbing my deep thoughts. The caller wanted to know if I would be willing to participate in a private discussion of 5G applications with a group at an upcoming conference. One of the problems with talking in general about “5G applications” is that the phrase itself means different things to different people– and they all can be quite passionate and vocal about their favorite application. Internet of Things (IoT) network enabler with low energy, low latency, mobility, ubiquitous connectivity, security, and billions of nodes. Wireless network unification– replace WiFi, and a myriad of other short range wireless networks with one standard network. I’m not one who believes spectrum is scarce, but it is highly regulated. Spectrum allocation suffers from the same rent-seeking problems seen when government and corporations collide (or collude). Applications 3 and 4 may require expansion into parts of the RF band (above 30 Ghz) that present big challenges. The wavelength for these frequencies is in the range of 1 mm to 10 mm so it is called the millimeter wave band. The main problem is signals encounter much more attenuation at these wavelengths. Thus they can’t travel as far as today’s cell signals do and they don’t penetrate walls well. Since we can’t change the main culprits in our environment, walls, water vapor, and oxygen, we have to space the radio transmitters and receivers closer together and/or use beamforming technology to focus the signal only where it is needed. Beamforming is spatial filtering– focus the signal energy where you want it like a flashlight does. You focus your signal on the target rather than spread it all around. Beamforming works great for fixed entities– like an antenna array in a factory talking to a machine bolted to the floor. Beamforming is much harder for anything moving rapidly– like a car. The telcos are looking for ways to extend their cellular franchise and perhaps reduce cost in last mile connectivity. Given the network architectures proposed though it remains to be seen if there is a compelling cost reduction in widespread fixed wireless broadband. They may just stay with fiber/coax to the home. They may decide that fixed wireless broadband, given its much higher speed, is a good replacement for DSL though. I see 5G cellular and WiFi as more complementary than one replacing the other. WiFi Alliance says there are more than 30 billion WiFi capable devices in the world today. WiFi hot spots are ubiquitous. Each technology continues to evolve to higher bandwidths. The big chip and equipment providers like Cisco, Qualcomm, and Broadcomm are betting on both. I don’t see application 4 as likely to happen. Hmmm, but what about application 3? We have had a remote monitoring application for some time now called BBD Control. 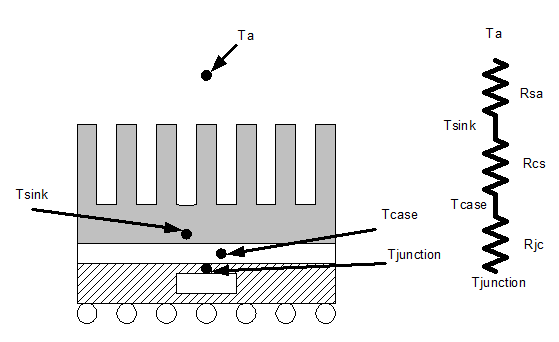 Typically we monitor temperature and various sensor voltages. Time-stamping and logging measurements to a file are sufficient for many applications but the types and amount of data that can be collected today is remarkable. To me, this is the true promise of the Internet of Things (IOT). It is not about 5G connectivity so much as it is about getting accurate data in people’s hands. I’ve seen sophisticated post-processing and analysis lead to great insight based on a simple log file of accurate data. The promise of Big Data all starts with the data. As we got into more demanding applications we developed a web based interface that controls measurements and displays results in tabular format so you can check on things remotely using a web browser. Along the way we added an SMTP email capability to inform users of measurement results and alarms. This turned out to be quite handy. It is nice to be able to show someone an event happening in their system miles away while having a nice lunch at the Farmer’s Daughter ( a local favorite). Recently we got involved in a project to add AC power measurements to BBD Control. We measure and analyze power draw. This entailed adding a small microcontroller based circuit board and fair amount of software to control and display the measurements. It measures AC voltage, current, and frequency. Then it calculates real, apparent, and reactive power. Here is a screenshot I grabbed of the power monitor in action. It is quite useful for applications like measuring power draw for a custom block chain processing engine running different software algorithms. 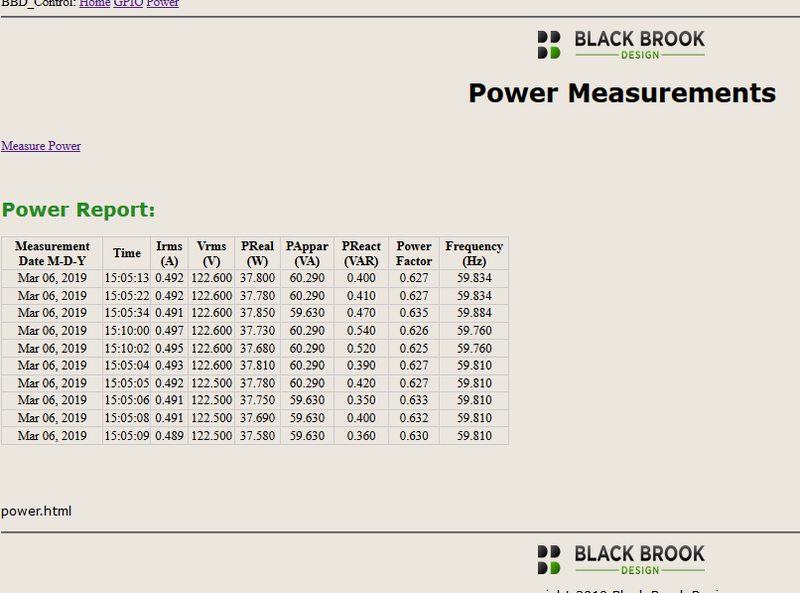 We scroll the 10 most recent measurements in a table on the power monitoring page. Measurements are initiated by clicking on the measure power button or they can be made automatically at fixed intervals.